They may be pre-verbal, and pre-mobile, but they're not pre-Musical! 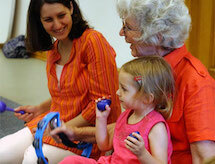 A specially designed one-semester introduction to music for our youngest music-makers. Musical activities such as finger play, lap songs, peek-a-boo songs, gentle dancing and songs without words are emphasized. The pace is a little slower and quieter than our mixed-age classes, so there's great opportunities to notice and encourage the babies' musical responses. You'll learn dozens of new songs and chants to sing to your baby all day long. And you'll hear a lot of great tips about how to encourage their musical and language development, and ways to have sound-and-movement conversations with them. If your baby is already or nearly crawling, it's time for them to join one of our many mixed-age classes. You can check out that schedule here.